Established in 1959, Mesa Verde Country Club has always been a family-oriented club which takes great pride in promoting leisure and competitive sports activities and friendships for its members, their families, and guests in a variety of ways. Mesa Verde has always been known for its challenging golf course which is highly regarded not only in Orange County, but throughout the country. Mesa Verde provides its Members and their guests outstanding golf and practice facilities, a complete tennis facility with clubhouse, heated swimming pool, varying dining facilities and programs together with meeting rooms to promote camaraderie and friendships among the Members. Frequently, Members remark that Mesa Verde is more than just a private country club; it is a small community of friends having diverse but at the same time, similar interests. Mesa Verde offers a sense of belonging and the coming together of family and friends. Mesa Verde recently celebrated its 50th anniversary and has one of more interesting and impressive histories of private clubs in Southern California. American Indians, ranchers, produce farmers, investors, developers, and multi-national corporations have played a part in the history of Mesa Verde. Mesa Verde Country Club resides in the planned community of Mesa Verde located in Costa Mesa, California. The Santa Ana riverbed and bike path run along a portion of the course. The land upon which the club was built was once inhabited by an ancient civilization of Indians and later became part of the great Rancho Santiago de Santa Ana. Father Junipero Serra often visited the area as a retreat. The small, adobe casita he occupied still stands on a lofty knoll a short distance away from the Club. In 1953, the Schroeder family purchased 152 acres of land in Costa Mesa for about $122,000 to grow yams, lima beans and other farm products. During the Southern California housing boom of the 1950s, the land on which Mesa Verde sits was sold to a development company which in 1957 announced plans to build “Mesa Verde Country Club and Estates”. Famous golf course architect William F. Bell designed the course in 1958. The original development was troubled by a variety of terrain and utility problems which resulted in a decision to sell Mesa Verde Country Club to a subsidiary of Boise Cascade which later sold the club to Japan Golf Promotions. The membership purchased the club in October, 1975 for a cost of $2.1 million. Mesa Verde opened without a formal clubhouse in 1959. A Quonset hut served as a temporary facility until a permanent facility was constructed in 1960. From its inception in 1959, Mesa Verde has hosted a number of professional and amateur tournaments beginning with the Orange County Open in 1959 which was won by Jay Hebert. Most golfers remember Billy Casper who captured the second Orange County Open in 1960. Perhaps the most famous winner of the fourth and final Orange County Open was Tony Lema whose name continues to be identified with Mesa Verde by way of a variety of memorabilia and the Tony Lema banquet room. When Tony won the Orange County Open in 1964, he insisted on champagne to celebrate earning him the nickname “Champagne Tony Lema”. Besides PGA Tournaments, Mesa Verde has hosted a number of LPGA events including the Kemper Open and Uniden Invitational which were won by, among other Hall of Fame lady golfers, JoAnne Carner, Nancy Lopez and Pat Bradley. In 1995, Mesa Verde hosted the initial Toshiba Senior Classic which was won by George Archer. Finally, Mesa Verde has hosted a number of prestigious amateur events such as the USGA Girls Junior Amateur Tournament. Finally, in 2000, the Members recognized that to remain first class, Mesa Verde needed a new clubhouse. 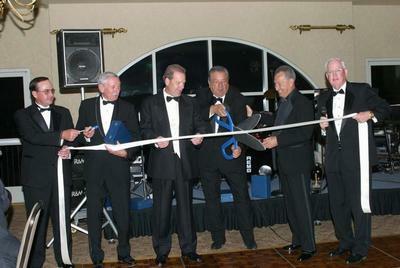 After a close vote, in 2003, a new clubhouse was completed and inaugural party held for the Members. Our new clubhouse offers spectacular views of the golf course and the snow capped mountains in the background and luxury amenities In sum, Mesa Verde Country Club is a true hidden oasis that offers a special lifestyle for its Members and their guests. From its inception, Mesa Verde Country Club has been known for its premier championship golf course. Course construction began in 1958 under the watchful eye of renowned designer Billy Bell. The official opening was held in January, 1959. When opened, there was a large, hangar-style, Quonset hut located near the first tee that served as a temporary shelter and cart barn when PGA Tour players competed for $15,000 in prize money at the first Orange County Open held ten months after opening. Pleased with his first place winnings of $2,000, Jay Hebert praised the young course and the crowds who came to watch the pros play. Hebert commented the greens were excellent and the galleries magnificent. Another participant, Joe Kirkwood, Jr., described the course more fully declaring just as today’s members that “every hole on this course plays different. No two holes are alike. You have to think yourself around this course. 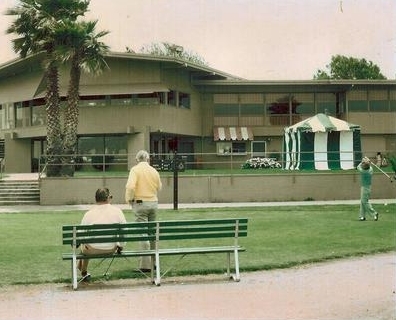 Mesa Verde’s first permanent clubhouse was in place in 1960, when Billy Casper took top honors at the second of four consecutive Orange County Opens. Bob McCallister claimed the trophy in 1961 then in 1962, Tony Lema, after three grueling holes of a sudden death playoff with Bob Rosburg, claimed victory. Celebrating his first PGA Tour win, Lema provided free flowing bubbly to members of the press earning him the nickname “Champagne Tony.” To this day, Mesa Verde’s banquet facility which offers a stunning view of the Ninth and Eighteenth holes, continues to be known as the Tony Lema Room. After his first PGA victory at Mesa Verde, Lema went on to rack up more impressive wins such as the 1964 British Open. Before his untimely death in a plane crash in 1966 at the age of 32, Lema was ranked with Arnold Palmer and Jack Nicklaus as one of the top three golfers in the world. Mesa. Champagne Tony might be gratified to know that he is well remembered at Mesa Verde, as his photograph and golf clubs are still proudly displayed for members and their guests to see. Mesa Verde has continued to gain prominence through the years by hosting additional major golf events such as the PGA Haig and Haig National Open in 1968, Regional U.S. Open Qualifying Tournament in 1973; three consecutive LPGA Women’s Kemper Opens in 1979, 1980, and 1981; three back-to-back Uniden LPGA Invitationals in 1984, 1985, and 1986; the United States Senior Open a Sectional Qualifying Round in 1991; United States Junior Girls Championship in 1993; and the 24th Edition of the Girl’s Junior America’s Cup Matches in 2001. When the inaugural Toshiba Senior Classic was held at the club in 1995, it was the first PGA event to be held in Orange County since MVCC hosted the Haig and Haig National Open in 1968, and the $800,000 purse was a far cry from the $15,000 prize money available at the that first Orange County Open. Tiger Woods, who played a round at MVCC at the age of six, is just one of many who have played the course and later gone on to become a true legend in the world of golf, along with Arnold Palmer, Tony Lema, Johnny Miller, Chi Chi Rodriguez, Lee Trevino, Dave Stockton, George Archer, JoAnne Carner, Pat Bradley, and Nancy Lopez, to name a few. In fact, Tony Lema and Chi Chi Rodriquez share the competitive course record for men with matching scores of 64. Later, Tiger and the Tiger Woods Foundation have hosted a number of charity clinic’s and tournaments. Another legend, Nancy Lopez claims that distinction for women finishing with rounds of 66 in both the 1980 Kemper Open and the 1986 Uniden Invitational. It is not unusual to see many of today’s professionals such as Vijay Singh playing a round of golf at Mesa Verde. A few of Mesa Verde’s own also have distinguished themselves in the world of golf. Don Turner and David Ray at one time represented the club in the USGA Amateur and USGA Mid-Amateur Championships, and by virtue of his runner-up finish after a sudden death playoff in the 1985 United States Amateur, Brian Lindley was invited to play in the prestigious Masters at Augusta. Frank Crinella qualified for the United States Amateur Championship in 1991 and Duke Duclos competed in the 1991 British Senior Open Amateur Championship, finishing thirtieth in a field of 186. Finally, Pete Daley was a Quarter-Finalist in the U. S. Senior Amateur 1999 and 2000 along with Farrell Hinkle who competed in the Sr. British Amateur 2001. On the distaff side, Dora Donaldson once won the California State Amateur Championship. Natalie King and Susan Kanning, among others, have also made the club proud. Natalie took top honors in her flight of the WSCGA Annual Mid-Winter Invitational in 1986, and Susan won the WSCGA Southern California Championship Tournament in 1987. Finally, many of the Club’s junior golfers have excelled, but two in particular have achieved exceptional victories. In 1983, Mesa Verde’s Kim Saiki, who is now on the LPGA Tour, was the first junior girl to win both the USGA and World Junior Girls Championships the same year earning her the honor of being ranked the number-one junior girl golfer in the United States by Golf Digest. Austin Maki was the runner-up in the USGA Boys Junior Championship in 1989. The PGA professionals an their staffs who have served at Mesa Verde have always been top quality as evidenced by current Head Golf Professional Tom Sargent who in 1997 was named the National PGA Golf Professional of the Year and inducted into the inaugural class of the PGA Hall of Fame. Tom is a well known and respected golf instructor who boasts of former students which include PGA Tour player Bob May; LPGA Tour player Kellee Booth and current PGA pro Cameron Trigale. Tom has taught over thirty National Junior All Americans, four of whom have gone on to become USGA National Junior Champions; twenty-five NCAA All Americans; seven SCPGA Players of the Year; and eight Orange County High School Players of the Year. Under the leadership of these professionals, the golf program at MVCC has been and continues to be exceptional. Mesa Verde’s membership enjoys leisure and competitive play among club friends and acquaintances. There are a full variety of tournaments, team play for men and women, and couples events for all levels of golfers throughout the year. Mesa Verde is also well-known for having one of the finest Member-Guest tournaments among private clubs in all of Southern California. In 2010, Mesa Verde celebrated the 50th anniversary of this event. Lastly, Mesa Verde has an extensive junior golf program where children and grandchildren to are introduced to and learn the game of golf, its honor and etiquette which they can enjoy for a lifetime. Family ties have been strengthened by Mesa Verde’s Junior Golf Program is open to member’s children and grandchildren. Many of Mesa Verde’s members junior golfers have led their high school and college golf teams to many titles and some, like Mark Taylor, Chris Beck, and Chris Hopkins have gone on to pursue golf-related careers on the links and in the golf industry. In sum, golf at Mesa Verde is more than a leisurely stroll on a beautiful course. It is a lifestyle.